It was a dubious affair. And no one spoke of Krakens. Instead, I will note that exactly a year has passed since I have started keeping this journal. 1. Become far richer than Jack. 2. Been thrown in gaol on three separate occasions. 3. Hit on the head six times. 4. Threatened Pat no less than thirteen. 5. Been drunk with Buchephalus every fortnight. It has been quite a good year. The last week was spent in nervous expectation of Patrick regaining full cognizance of his surroundings. The “hero” is now the toast of London, and not a day has passed without a servant or footman pounding on the door and extending an invitation to a banquet or dinner. These invitations are not, in turn, extended to either Jack or me. Some even have the temerity to address their notes “Patrick Thrasher ONLY” which has Jack in a state of fits. Now I would be content to let Patrick deal with his fame and catch up on my sleep, but at present he is incapable of receiving any visitors. In fact, the only word that he has said since his accident is “muffin.” Now “muffin” might be some sort of endearment for Odyllia. Or it might be a request for breakfast. What “muffin” is not, is a suitable response to the Duke of Glouchester’s request for your presence at his ball. This is a shame, since the Duke's daughter is reputed to sport the best pair of “muffins” in all of England. I awoke this morning feeling very under the weather. Indeed, my hands were shaking so that it required a full 20 minutes for me to put on my breeches, and my head was in such a spin that I had to clasp the banister with all my strength in order to maneuver myself down the stairs. The reception that awaited me once I reached the breakfast chambers was not one to assuage the natural anxiety that is attendant upon having an incomplete memory of the events of the previous night: Sean and Patrick were seated at table in a frosty silence, with pursed lips and folded arms, looking for all the world like a pair of old harridans from a Convent School. They both refused to speak to me—even my manservant, George, gave me a cold look—and I was constrained to reconstruct the events of yesterday's dinner party without their help. It all started rather innocuously—I remember that. Sean had invited a number of Patrick's acquaintances to celebrate his recovery, and I was in good form, beginning supper with a story about the hilarious two weeks when Patrick insisted on wearing a turban and trying to persuade my maids to feed him grapes, after an infected bite from a Macaque caused him to believe that he was an Indian Rajah. The evening took something of a downturn after that. I remember standing somewhat shakily on a chair to propose a toast, and embarking on a rather lengthy tale—one of my favorite stories about Patrick—about the time he came home drunk and angry from a meeting of the Royal Society in which they had debunked one of his scientific papers, and entertained me for a full hour with his wonderful impersonations of the Society's illustrious members (his Isaac Newton is absolutely dead on), or, as he called them, "those pompous bloody asexuals who couldn't tell you the difference between a red-blooded woman and a common house plant except that the one is homo sapiens and the other is Geranium sanguineum". I am now painfully aware that this was not the most opportune moment for such a history, since—as Patrick was quick to point out when he finally consented to speak to me a few minutes ago—our guests consisted, almost exclusively, of his friends and colleagues from the Royal Society. I do not often admit to remorse, but for my role in this particular event, I am very, very sorry. "Tell Nguyen Phuc Tan he will have his tribute, but please, spare my life!" I have made a note to ask Patrick what in God's name that means once he is fully recovered. It is not always intentional, but he really is good for a laugh sometimes. I am always the first to admit a mistake, and in this particular case I am more than willing to concede that I may have made a slight error of judgment in assuming that Patrick had drowned, when it was reported to me that his ship had been lost at sea. And I will even magnanimously concede that I was not displeased to discover that he had survived the disaster more or less intact. But I will not go so far as to say that I am glad to see him back in my home, as his first act upon returning to London was to dislodge a large stone above my entrance onto his forehead and then bloody up all the sheets in his bedroom beyond any hope of using them again. Again, it must be admitted that I had a small part in this accident, having loosened the stone myself in the hopes of squashing Patrick's tiresome brother EJT, but it really is just typical of Patrick to impose himself where he is not wanted and ruin a surprise that was clearly intended for someone else. Sean has spent the last two days running about like a mother hen, "soothing Patrick's troubled brow" (his words) and otherwise making a nuisance of himself, during which time I have been attending to man's business and sorting out our differences with the murderous EJT over a game or two of golf. As a result of this careful and exhausting diplomacy, Patrick's brother has graciously promised that he will not point his gun at us again without giving us at least a day's warning—which may at least be called progress. To be honest, EJT is actually quite a reasonable fellow despite his homicidal tendencies and maniacal religious fanaticism, and he plays a surprisingly decent game of golf. 1. Loosen the floorboards in the Study. 2. Place my Musket under the desk. 4. Loosen stone block above entrance. 5. Fox traps in corners!!! 6. Bake Sean a cake. The cake, alas, was not forthcoming. Instead, we labored with murderous intent, transforming Jack’s comfortable domicile into a Chamber of Horrors. No particular was left unnoticed and I expect Buchephalus himself was expected to wield a knife at the appointed hour. At the stroke of eight there was a knock on the door and EJT was allowed entrance to the house. We stood thirty feet away, but upon noticing that he brandished no weapon, endeavored to steer him clear of the traps and into the study. What followed was a conversation so awkward, that it made the terror of the previous fortnight all the more ridiculous. EJT – Godless Sinner Shepherd, may I bother you for a spot of tea? EJT – I must say that for a pair of filthy Papist Scum, you keep a remarkably nice house. Jack- Well, business has been good to us lately. EJT – The business of killing my brother and making a mockery of his funeral? The conversation was to continue in this vein for quite a bit of time. Tea turned to wine and we soon found ourselves slumped around Jack’s desk, swapping Patrick stories. Just as Jack had reached the climax of the especially delightful anecdote about Patrick and a donkey, EJT drew his pistols and leveled them at our heads. Jack dropped to his knees to beg forgiveness and it looked like I was once again in the position of having to save his miserable life. EJT – Gentleman, your time is up. And my 29th year would have begun not at the Crimson Unicorn but ended in a bloody heap on the study floor but for a large crash at the front door followed by some of the most Unchristian epithets I have heard spoken. The noise and screams proceeded to get louder and louder until finally the study door was thrown open by Patrick himself, the worse for wear after contriving to set off every trap we had set. Patrick took two steps into the room, fixed us all with a steady gaze, and then shouted “Happy Birthday Sean” and promptly passed out. Hoorah! I never thought Plymouth would look so good! Must dash for the post-chaise - longer post forthcoming upon my arrival in London. I have discovered a wonderful new pastime—so wonderful, in fact, that it is rendered only slightly less appealing by the revelation that it was invented by the Scots, whose only other notable accomplishments are a monopoly on the market for tartan skirts for men and a pathological fondness for oats. The game I am referring to involves hitting a small ball with a large stick as hard as you can, sending your servants in search of it for half an hour while you relax with a tankard of ale, and then hitting it again until it falls into a hole, at which point everyone slaps you on your back and congratulates you. I intend to devote every leisure hour I have to improving at this game, and I have already begun practicing at home, hiding balls in various locations around the house, and watching with great mirth while my maid scurries about in search of them. But more on that later. The purpose of this post is to reveal that I have finally discovered the identity of the gentleman named EJT, who has been plaguing us for more than a month now with threats upon our lives, disquisitions upon the state of our souls, and other such aggravating impositions. As I was reading through the comments on my most recent entry today to check up on a conversation I was having with a Peep This Diary reader who attended preparatory school with me, I noticed a comment from EJT himself and followed it back to his own preposterous blog, where I learned that he is none other than Edward James Thrasher—Patrick's older brother! His likeness to Patrick—in both his physical appearance and his unbearable pompousness—is uncanny, and it serves to explain the apparition at Patrick's funeral last month that we all thought was a ghost. I recommend that you peruse his blog, which can be found here. There is some good stuff about monkeys (an obsession that is evidently shared by the entire Thrasher family), as well as a comprehensive (albeit homicidally insane) explanation of his plans for engineering my gruesome death. He also says some nasty things about Sean, which I must admit are not entirely without merit. We have arranged to meet at the beginning of next week and "have it out", so I will be certain to tell you how that goes. 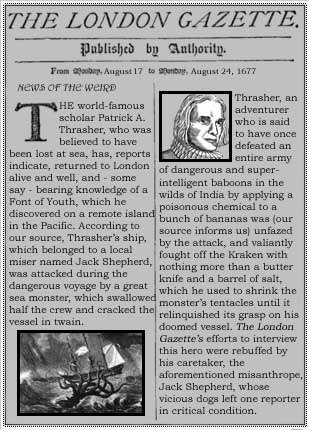 Having met this pathetic character some years ago before he was lost at sea (another unfortunate tendency that runs in the Thrasher family), I can tell you that I am not particularly concerned about our impending encounter.